Because cooking takes so many nutrients and vitamins OUT of food, you automatically start feeding your body what it needs when you stop cooking food and start eating uncooked, nutrient-rich foods. A raw carrot has exponentially more nutrition than a cooked carrot. Maybe this kind of a diet is for you. How would you know? These articles give you all the information you need about whether the Raw Fo… od diet would be a good choice, and all the benefits of eating healthier. 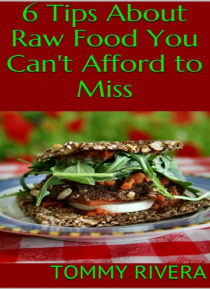 In this ebook, you'll find helpful tips on:-Never Before Heard of Raw Food Tips-Things You Need to Know About Raw Food-6 Things You Didn't Know About Raw Food-And MoreGRAB A COPY TODAY!